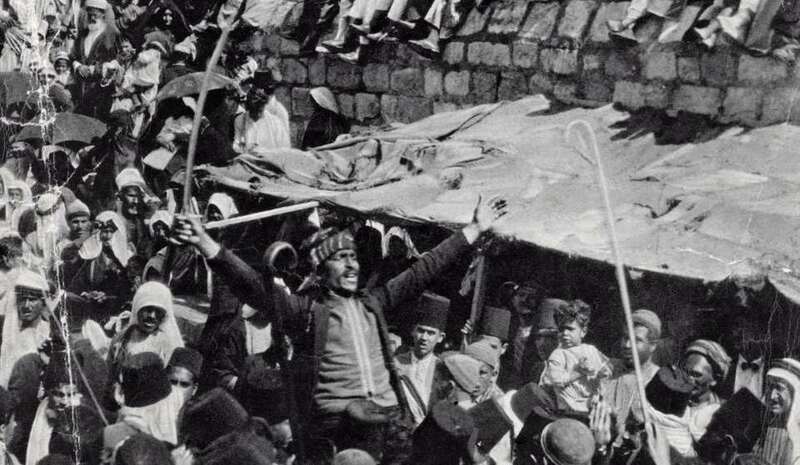 The Gathering of an Arab Mob, 1929. In the early afternoon of Friday August 23rd, 1929, Yosef and Yehuda Rotenberg, master plasterers and whitewashers, were wrapping up another day of work on a transformer belonging to the Jerusalem Electric Company. The Sabbath was only a few hours away and they were hurrying home. Yosef and his younger brother Yehuda, still carrying his trowel in his hand, turned towards Jerusalem’s Jaffa Gate. They were at the wrong place at the worst possible time. Yosef was born in 1896 in the town of Wlodawa, in present day Poland. He grew up studying in the small town’s cheders; upon reaching the age of 16, however, he decided to broaden his horizons and education by moving to Warsaw. In Warsaw he deepened his learning of the Torah and was a frequent visitor of the library near the Great Synagogue of Warsaw, then the largest in the world. He spent the next years studying under Samuel Abraham Poznański until the outbreak of the Great War which forced him to return home to Wlodawa. Back in Wlodawa he helped his father with his business affairs and dreamed of opening a library in the small desolate town. At the end of the war, as the German forces were leaving Poland, Zionism was gaining popularity among local Jewry and Yosef was one of the movement’s foremost leaders in town. He finally managed to establish that library he dreamed of and began raising funds for the nascent Zionist movement. He built, with his own hands, a Zionist Community Center to house all the Zionist organizations in Wlodawa and devoted the majority of his time to the endeavor. In the evenings he preached for the emigration to Erez Yisrael. In March 1925, he arrived in the Holy Land and met his younger brother, Yehuda, who arrived in Tel Aviv a few years earlier. Shortly afterwards they were joined by their sister Zipora. Yehuda started working as a plasterer and a few years later moved with his brother to Jerusalem. By this time they were both considered master craftsmen and never lacking for work. 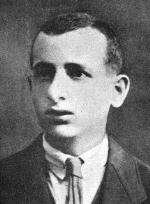 Yehuda, Yosef’s younger brother, born in 1898 in Wlodawa. As his brother before him, he studied in the town cheders, and also gained a broader secular education. Like his brother, he joined the Zionist movement at an early age and became a member of The Mizrahi. Unlike his older brother, however, Yehuda was introvert and a silent individual; always preferring to find the quiet corner rather than the podium. While his older brother was busy learning the various crafts of construction, Yehuda turned to agriculture in preparation for the inevitable emigration to the land of Israel, which he finally completed in 1919. During the years after the Great War chaos still reigned in Europe; the roads were dangerous to travel and Yehuda got delayed in Romania. 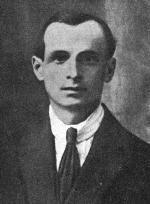 He eventually reached Erez Israel in 1919 where he joined the Histadrut and aspired to gain employment in agriculture but failed. Life was difficult for Yehuda – he was often short of work and his financial situation perilous; His family and friends kept sending him money from Europe but he kept returning it back. Yehuda finally managed to find work in construction and shortly afterwards his brother joined him in Tel Aviv. Almost a year before that fateful Friday afternoon in August, a prominent Rabbi arrived for prayers at the Wailing Wall. The Rabbi was visiting Jerusalem on a trip from Europe and when he arrived at the wall he requested that a few chairs would be brought over and a divider be placed to separate men and women during the Yom Kippur prayers. Unbeknownst to the Rabbi, who was following Jewish Ashkenazi tradition, this was in direct contradiction to the status quo in Jerusalem, a status quo supposedly existing since the days of the Ottoman Empire. The British Police promptly and forcibly dismantled the divider. The Mufti of Jerusalem, however, used this incident as a pretext to incite local Muslims and accuse the Jews of attempting to seize the Al-Aqsa Mosque. 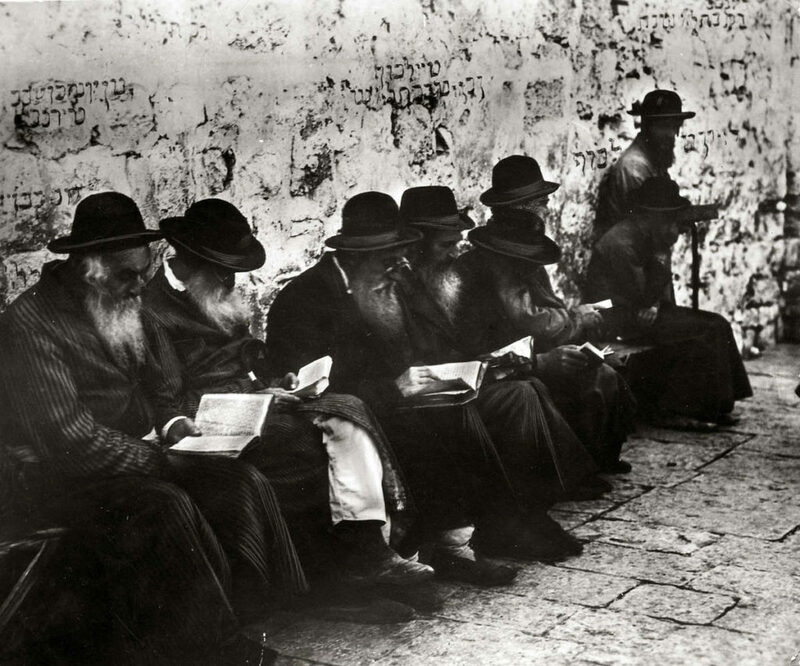 Orthodox Jews pray at the Wailing Wall in Jerusalem, 1929. The virulent propaganda campaign that followed, calling for Jihad against the Jews, resulted in the frequent beating and stoning of Jews worshiping at the Wailing Wall throughout the following months. On Tisha B’Av August 15, 1929, a day on which Jews commemorate the destruction of the Holy Temple, several hundred members of the Zionist youth movement Betar, organized a march to the Western Wall to protest British restrictions on Jewish prayer, and to reaffirm their Jewish connection to the holy site. They waved the Jewish national flag and sang Hatikvah. The following day, mobs of armed Arab worshipers inflamed by anti-Jewish sermons, fell upon Jewish worshipers at the Wall, destroying Jewish prayer books and notes placed between the stones of the wall. A few days later, on August 17, a Jewish boy was killed by Arabs during ensuing riots in the Jerusalem neighborhood of Bukharan. Jerusalem was reaching its boiling point. The following Friday, 23 August, thousands of Arab villagers streamed into Jerusalem from the surrounding countryside to pray on the Temple Mount, many armed with sticks and knives. The riots broke out shortly after noon on that Friday; they took the form, in the most part, of attacks by Arabs on Jews. During the week of 23 to 29 August the riots spread throughout the British Mandate of Palestine, most violently in Jerusalem, Hebron, Safed, and Jaffa where Jewish communities were massacred. In total, 133 Jews were killed by Arabs and 339 others were injured; while 110 Arabs were killed and 232 were injured — the vast majority by British Police while trying to defend attacked Jews and suppress the riots. The question of whether the first fatality was Jew or Arab preoccupied the Shaw Commission that was set up to investigate the riots. 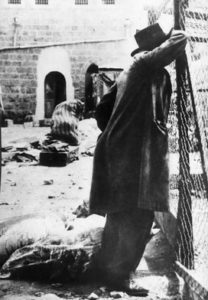 In their early hours the disturbances involved numerous Arab attacks on Jews throughout the city and a few Jewish retaliation attacks. I was called down there [to Jaffa Gate] at about 13:30 hours. The crowd was there then, and I tried to force the crowd to the main road.Two Jews dashed across the road through the crowd; they were attacked with sticks. The crowd then numbered about 200. Some had knives, some stones, and some swords. Most of them carried heavy sticks. This crowd gathered right around us. Corporal Shalom was then injured by a stone. We remained there as long as we possibly could and were forced about two meters beyond the doors. They got into the shed and then stopped throwing stones. Yosef and Yehuda Rotenberg, aged thirty three and thirty one, were buried in a mass grave for the Jewish dead of the 1929 riots in Jerusalem.